Naturally once we saw there were more Ultra Beasts coming to the games, we knew they’d show up in the TCG eventually. So now we get to see the latest addition to the Ultra Beast line-up, Stakataka, who…they did what, stack a bunch of alien bricks on top of each other? Unassuming, but a lot cooler than it sounds. Stakataka-GX is a Basic Metal Ultra Beast Pokemon-GX, 180 HP, with a Fire Weakness, a Psychic Resistance, and a Retreat Cost of 3. Its Ability Ultra Wall lets you lower the damage that Ultra Beasts take by 10 damage after Weakness and Resistance are applied. Its attack Gigaton Stomp is a simple 3-for-120 vanilla strike, and Assembly-GX costs the same and deals 50 damage for every Prize card you’ve taken. Ultra Wall is definitely the most appealing aspect of the card, allowing your Ultra Beasts to be tankier than usual. Throw down multiple Stakataka-GX, and you can reduce incoming damage by up to 40! That doesn’t sound like much, but considering that we’ve been talking about a few Tools that increase damage recently, every little bit counts. Gigaton Stomp is also pretty solid, hitting for just the right amount to 2HKO most things unboosted, and Assembly-GX is great for finishing things off. The big problem I could see with running Stakataka-GX as a main attacker is how you’re going to get enough Prizes to use Assembly-GX, since Gigaton Stomp will still take two turns. With 4 in play, it effectively takes 220 damage to OHKO a Stakataka-GX (and technically about 130 twice to 2HKO, considering 40 damage will be taken away) – and that’s about on average for most competitive decks. Never mind that you’d need 5 Prizes to make Assembly-GX OHKO. At the very least, he finds a good partner in Naganadel-GX, who can take advantage of the number of Stakataka-GX you put in play to Beast Raid for maximum damage! Arora Notealus: Stakataka is definitely one of the more interesting Ultra Beasts to come out of the woodwork. Sure design-wise, he doesn’t seem like much at first, but there’s some interesting yokai that actually inspired his design. It’s not the first time that yokai have inspired Pokemon designs, and considering the large number of yokai out there, it’s unlikely that it’ll be the last. Next Time: Shining like a star and bringing creatures from afar! Stakataka-GX (CES 102) debuts in the format as the latest Big Basic Ultra Beast to enter the game. This Pokemon raised eyebrows all through the Pokemon TCG universe because of its ability Ultra Wall which reduces damage done to Ultra Beasts from attacks by ten. This applies to all Ultra Beasts – including those on the bench – and compounds upon itself. If you have four Stakataka in play, an unmodified Jet Punch just shimmies in place a little bit before the green “Your Turn” message appears on the screen. Stakataka’s main attack Gigaton Stomp – three attachments (two Metal, one Colorless) with no side effect – does a disappointing 120 damage, although Assembly GX will OHKO pretty much everything if you have only a single prize card left to take. So the key with Stakataka will be how many you can get out, and how effective Ultra Wall really is. If you’re going up against Zoroark GX, Riotous Beating still probably TwoHKO’s you. Ultra Necrozma needs three Psychic attachments whether you have one or four Stakataka in play. Rayquaza GX needs seven energy in play unless you have four Stakataka out. As I mentioned above, it can really dampen the effectiveness of Jet Punch, especially post rotation when all of those Strong Energy go away. But is there any major archetype out there right now where a TwoHKO against Stakataka becomes a ThreeHKO? Is there any Ultra Beast out there other than Stakataka where a reduction of forty damage twice will extend its life long enough to be able to turn a two shot into a three shot? I’m doubtful. If Stakataka reduced by twenty instead of ten I would definitely think that Stakataka could turn some Ultra Beasts into ThreeHKO’s. But a reduction of only ten per Stakataka in play? Rayquaza still will probably OHKO Stakataka, and – similar to Scizor yesterday – Fire decks will be completely indifferent to Ultra Wall. I played a best of three against one of the other writers at PDC the other night, Rayquaza vs. Stakataka, and Ray Ray took games two and three after losing the first match. I would have posted it on PokeDeckCentral’s Youtube page, but I lost power as I was rendering it. I know it’s early and we don’t really have “perfected” decklists for any archetype yet, but I do think that Rayquaza beats Stakataka at least two thirds of the time. Like I said, if Ultra Wall reduced damage by more than ten, then Stakataka would be significantly more effective. Maybe if they had made it so that Stakataka reduced non Ultra Beast attacks by twenty and Ultra Beast attacks by ten… but now I’ve wandered way too far into the hypothetical. As it is, Stakataka, unfortuntately, just won’t stack up. Stakataka-GX (SM – Celestial Storm 102/168, 159/168, 176/168) is our eighth-place finisher in the Pojo.com countdown of the top 10 cards of SM – Celestial Storm. Out of five personal lists, it appeared in one top 5, one top 10, and one Top 20, allowing it to earn 51 total voting points. I personally had it as my fourth-place pick. Stakataka-GX is a [M] Type Basic Pokémon-GX with 180 HP, [R] Weakness, [P] Resistance, Retreat Cost [CCC], the Ability “Ultra Wall”, the attack “Gigaton Stomp”, and the GX-attack “Assembly-GX”. 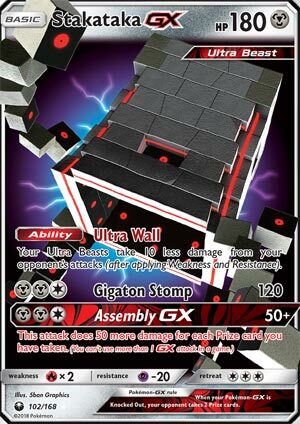 “Ultra Wall” reduces the damage your Ultra Beasts take by 10 after Weakness/Resistance, and multiple instances of it do stack. Gigaton Stomp is a straightforward 120-for-three attack, though its [MMC] cost means it will need some decent [M] Energy acceleration or else it’ll be painfully slow. Assembly-GX has the same cost, though at least it does something with itself to make it worth a slow build-up; 50 damage plus another 50 per Prize card you’ve already taken. So 50, 100, 150, 200, 250, or 300 damage in your typical match. Pretty bad early game, but it makes for a nice finishing blow to take your last Prize or two. I’ll get straight to the point; the purpose of this card is to stack the Ability and prolong the lifespan of your Ultra Beasts but… does it actually accomplish that? As a single, quite rarely, but Stakataka stacks! Two of them are enough to cancel out the damage bonus granted by Professor Kukui. Three cancel out a Choice Band and the bonus Bench damage from the “Jet Punch” attack of Buzzwole-GX. Making room and reliably getting three out ASAP is a big challenge, so we’re not even going to worry about having four out at once. Also, there are attackers that just won’t care, or at least won’t care much because of exactly what number actually matter. The new Rayquaza-GX (SM – Celestial Storm 109/168, 160/168, 177/168) hits big numbers repeatedly once it sets up; its “Dragon Break” attack fueled by six Energy on that player’s side of the field would go from scoring a OHKO against a 180 HP target to just barely whiffing with a single Benched Stakataka-GX, but a seventh Energy and even three Stakataka-GX won’t a 180 HP Pokémon. Once the Rayquaza-GX player accepts he or she must shoot for seven Energy, the slightly bigger Buzzwole-GX (190 HP) would need three Stakataka-GX on the Bench to just barely survive. Which is better than NOT surviving, but is asking a lot of modern Buzzwole-GX decks. Enter Naganadel-GX. It has 210 HP and an attack (Beast Raid) for [C] that does 20 damage per Ultra Beast on your Bench. Beast Raid isn’t hitting hard enough for OHKO’s but does achieve 2HKO-range. With such an inexpensive attack, Max Potion becomes an obvious power play if Naganadel-GX can survive a hit. The strategy has to worry about smaller hits accumulating, however, and since it is focused on 2HKO’s, anything that can 2HKO (or better) it right back should win the Prize trade. Drop a Bunch of Stakataka-GX on your Bench and you not only fuel the damage for Beast Raid but make it much more likely Naganadel-GX will be around to heal then attack the next turn. I’m not sure if this is a winning strategy now, but it is one of many I’ve heard buzz about post-rotation. For that matter, backing Buzzwole-GX with Stakataka-GX becomes more plausible at that time; the deck’s usual approach seems unlikely to work due to cards lost to rotation. Soaking damage can be very valuable or it can be pointless; I think Stakataka-GX should prove helpful, but I am wondering if it will be as good as I initially expected. There are more OHKO decks sticking around past rotation, and that has me nervous. Still, experiment with it in Expanded and enjoy it in the Limited Format, where a single copy is probably worth running solo, as you’ll probably attach [MMC] and start swinging away until you win BEFORE its 180 HP is chipped away. I’m not as excited about this card as I once was, and it mostly took fourth because its usage seemed so obvious at the time. Were I writing my list today, I suspect I’d move it down a few places but not boot it entirely. Which may actually be me swinging too far the other direction; the joy of trying to predict the game post-rotation!